For a cruising vessel, the Omar El Khayam has outdone itself. It features a gym, a sauna with massage services, a pool and a Jacuzzi. It carries 160 passengers on Lake Nasser in Egypt. It bills itself as a 'hotel on water re-imagined'. The Ship was refurbished in 2011 and now boasts some of the sleekest amenities on a cruising ship. From the ship's Sun Deck, you can enjoy 360-degree awe-inspiring views. What more, it boasts a restaurant that serves regional contemporary cuisine. Should you want to relax and enjoy a drink, there is a lounge with oversized chairs. More deck plans details are available here. The ship's staterooms are all suites. Among the amenities that you will enjoy inside the ship include; private bathroom with bathtub, flat panel TV, air conditioning, safe, refrigerator, hair dryer, and telephone. You will also get awe-inspiring views from the comfort of your suite. You can click here to view more details on the ship's staterooms. Listening the tour guide teach you about ancient building techniques in Egypt, Hieroglyphics, 5,000 year old dynasties, archaeological excavations and many more. This will be an enjoyable learning trip for you. Carry your camera with extra memory cards. You will have a lot of sights to capture. Make a reservation today. 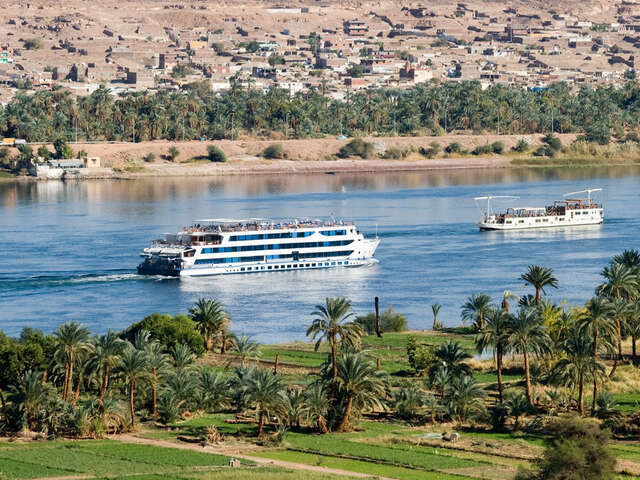 You do not want to go all the way to Egypt only to find that the ship is fully booked. Enjoy your trip!